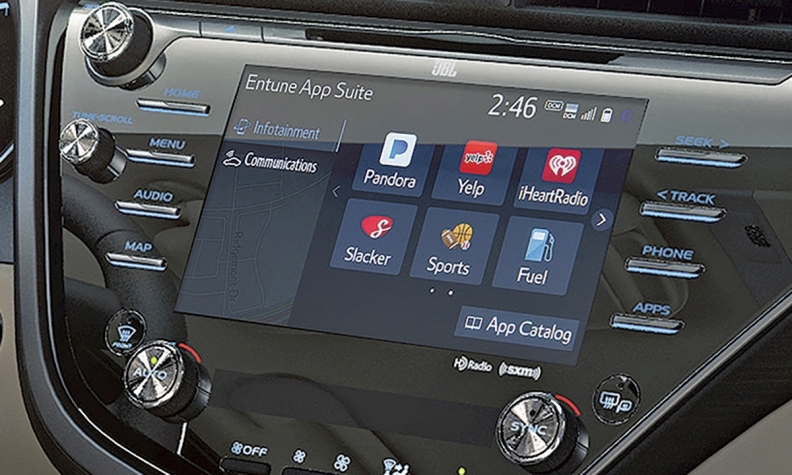 Toyota said its Entune system has better integration than CarPlay and Android Auto. DALLAS -- With this summer's launch of the 2018 Camry, which made its Canadian debut at the Toronto auto show Feb 16, Toyota is rolling out an upgraded infotainment system with features such as dynamic traffic information and high-speed wireless Internet connections. But what really makes the system stand out from the rest of the industry is that it still doesn't accommodate Apple CarPlay and Android Auto. Toyota remains the only major global automaker with no plans to incorporate the smartphone integration interfaces from Apple and Google into its infotainment systems. Toyota says its recently upgraded Entune 3.0 infotainment and app suite is a better alternative for the brand and replicates many of the features and applications in the Apple and Google products, but with better integration. Its Lexus marque uses a version called Enform. "It's our job as an auto manufacturer to have an engaging user experience, whether it's how the car feels when you're behind the wheel or how to use the centre stack and engage with smartphone applications," said Sandy Lobenstein, vice president of connected strategy for Toyota Motor North America. "Yes, there's risk," Lobenstein conceded. It's not entirely unusual for Toyota to march to the beat of a different drummer, as it has done with hybrids and hydrogen fuel cells. But some analysts say Toyota may be marching in the opposite direction of consumers by turning its back on CarPlay and Android Auto, which transmit apps and imagery from a driver's smartphone onto a vehicle's touchscreen. The stakes are high for Toyota, which has long enjoyed a sterling reputation for quality and fierce loyalty among its customers but risks losing favor if its infotainment offerings can't keep up with what consumers expect. Fussy infotainment units have dragged down quality scores for some auto brands, and CarPlay and Android Auto are emerging as popular solutions for bringing the smartphone's up-to-date entertainment, messaging and navigation apps more seamlessly into the car. "Toyota is definitely the odd man out," said Roger Lanctot, an associate director at Strategy Analytics, a technology consulting and market research firm. Lanctot said he respects Toyota for trying to develop a platform that integrates its own hardware and software with third-party apps, but he doesn't think it's going to be able to hold off Apple and Google for long. "The problem is that the auto industry is ruled in many ways by marketing and demographics, so it's going to be difficult for Toyota to stand their ground on this," he said. For example, Lanctot's son recently bought a Chevrolet Cruze in part because of its Android Auto integration. Stephen Baker, a vice president and analyst at the market research firm NPD Group, said keeping up with the pace of smartphone technology requires much greater scale than even Toyota has. "While I suspect that Toyota will be able to hang on for a while, sooner than later they will face challenges in getting developers to build for their platform and fall behind in the smart-car race." Over 200 car models from nearly every major brand offer CarPlay and Android Auto, according to Apple and Google. Mazda is another holdout along with Toyota. For years, carmakers were reluctant to cede infotainment real estate in their vehicles to the two tech giants, for fear that it would dilute their brand identity and limit potential revenue from such things as in-car purchases and data gathering. Toyota's Lobenstein said those considerations are still valid today. "We spend billions of dollars developing brand identities, and those brand identities are pervasive in the exterior designs of our vehicles, on the interior designs of our vehicles," he said in an interview. "The centre stack, where the radio is, you can see that from the two front seats and the three back seats and sometimes if you're in an SUV, from the third row," Lobenstein added. "That's prime real estate for OEMs to communicate their brand image." Another concern is data privacy and security, he said. Toyota can control that through a proprietary system and app suite "where we control the environment, we control the pipelines, we develop the applications." Entune 3.0 uses an open-source platform called Smart Device Link for third-party applications such as Pandora radio, Slacker, Facebook and Yelp. SDL was introduced by Ford and opened up to other automakers to develop alternatives to the CarPlay/Android standards. But the SDL alliance has attracted few other partners, and Ford has since decided to make its Sync 3 infotainment compatible with CarPlay and Android Auto for all 2017 model vehicles. Colin Bird, a senior auto tech analyst at IHS Markit, said he doesn't think Toyota's approach is a deal breaker yet, given its reputation for quality and reliability. "I think those are things that matter more" among auto buyers, he said. And he thinks the SDL platform has potential to be better integrated with a vehicle's existing controls and offer a greater range of "car-centric" applications, such as multiple navigation choices rather than just one with Apple and Google. At the end of the day, he said, consumer acceptance will depend on how the software and the hardware come together. "What really matters also is how carmakers are designing these infotainment systems," Bird said. "If people just get totally fed up -- they think the voice recognition doesn't work well and all this stuff is bad -- they're probably just going to move into the Apple or the Android environment." That, he said, could be as simple as doing what a lot of car owners already do: use a third-party cradle to attach their smartphone to the dash.